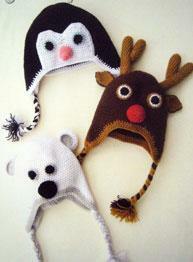 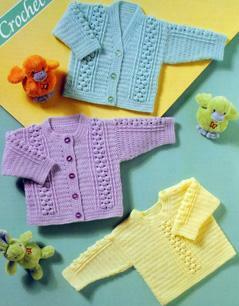 Sirdar 4477. 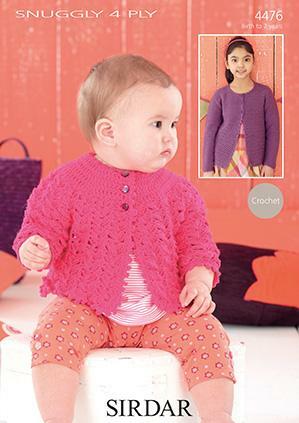 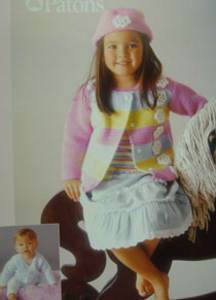 Long and short sleeved crochet boleros to fit 0-7 years (41-66cm) and shown in Sirday Snuggly 4 ply knitting yarn. 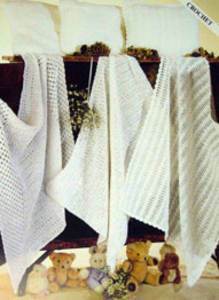 Ruffled scarves in one or two colours, a reversible beret which can be worn with lacy or plain side showing and flower pin, all to crochet in 4 ply. 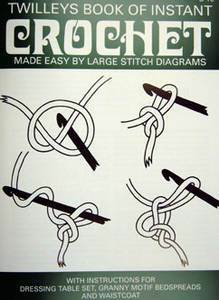 One size to fit average woman. 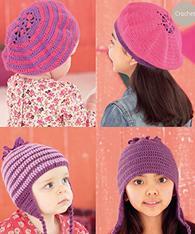 2 hat and scarf sets to crochet shown in Riot DK from King Cole - twirly scarf with plain hat and lacy hat, both in treble crochet. 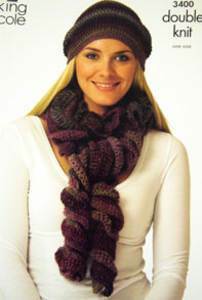 One size to fit average woman. 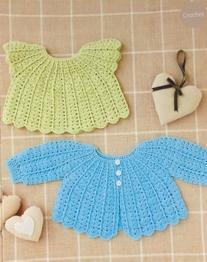 Crochet matinee coat is worked in trebles from the neck down with back and front in one piece. 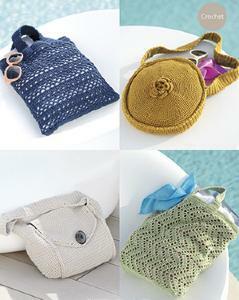 To fit sizes 46-51cm (18-20in). 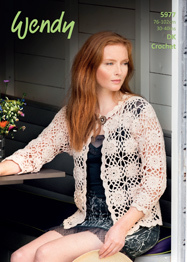 Crochet jacket or short sleeve top in treble crochet, using DK or 4 ply. 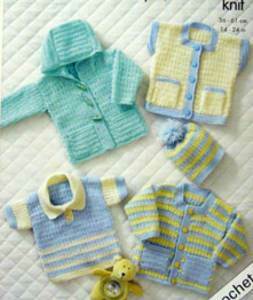 Includes premature size 31-56cm (12-22in)..
Hooded jacket, striped cardigan, short sleeve cardigan, polo shirt and hat in DK, from King Cole. 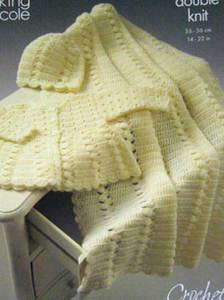 To fit 36-61cm (14-24in). 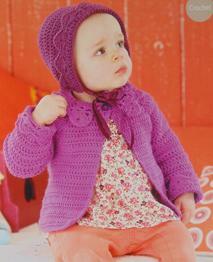 Lacy bolero, hat and pram blanket all trimmed with flowers, in treble crochet, shown in King Cole Baby Comfort DK. 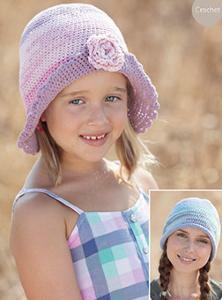 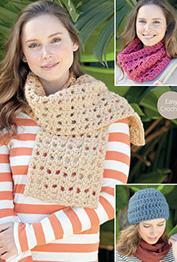 To fit 36-56cm 14-22in. .
Crochet shawl, matinee coat and hat in treble crochet, shown in King Cole Baby Comfort DK. 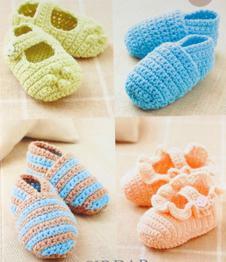 To fit 36-46cm (14-22in). 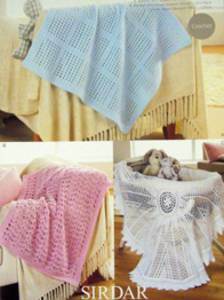 2 baby blankets to crochet, one with squares pattern, one with flowers, plus circular shawl, shown in Sirdar Snuggly DK. 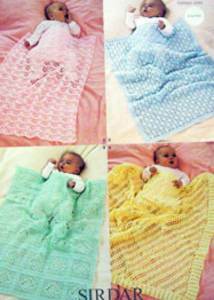 4 baby blankets from Sirdar to crochet in 4 ply - wave pattern, allover 'dotty' pattern, block pattern with lacy motif and diagonal design with edging. 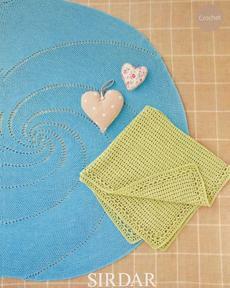 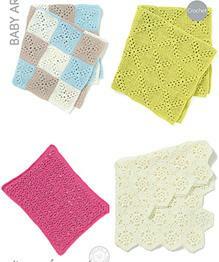 4 baby blankets to crochet in DK, including basket weave, and ribbon edged designs. 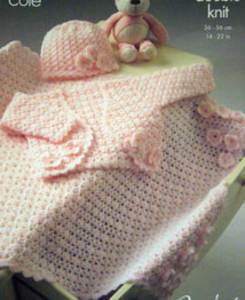 Size varies according to design but approx 48 x 61cm (19x 24in). 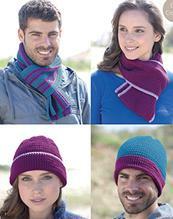 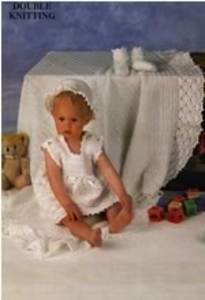 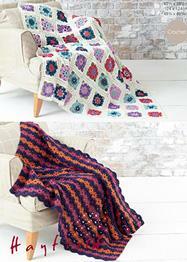 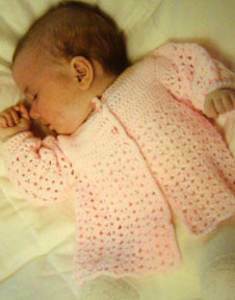 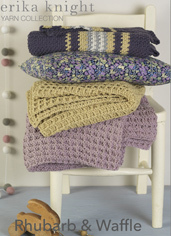 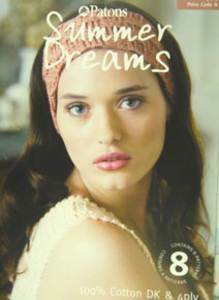 Choice of 3 crochet blankets and matching pillowcases, in 2 ply, 3 ply or 4 ply yarn. 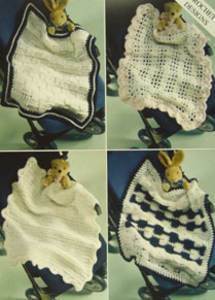 Blanket 66 x 76cm (26 x 30in): pillowcase 25 x 36cm ( 10 x 14in). 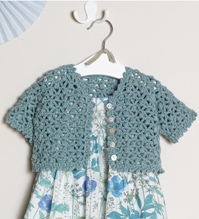 Katia Peru 27 crochet poncho in hairpin lace (requires netting fork), joined with double crochet and chain st. One size in chunky yarn - shown in Katia Peru. 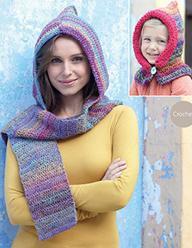 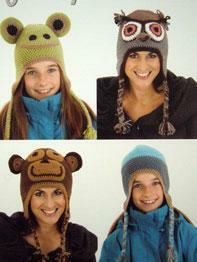 Stylecraft 4864. 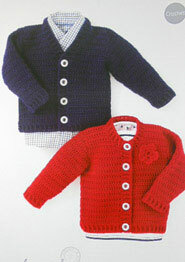 Babies 4 ply crochet v neck and round neck cardigans plus round neck sweater shown in Stylecraft Wondersoft 4ply to fit 30-56cm and 12-22 ins. 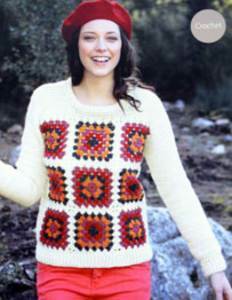 Sirdar 7076 crochet tunic in bar and lattice pattern with motifs shown in Sirdar Cotton DK to fit 81-107cm (32-42in). 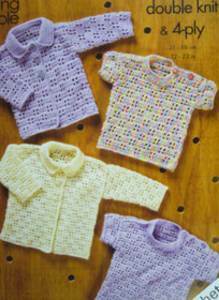 Sirdar lacy V-neck tunic in two lengths to fit 81-107cm (32-42in). 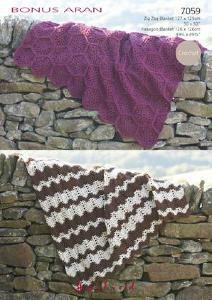 Crocheted in DK, 4 patterns and 7 rows to 9cm on 4mm crochet hook.